Sipping champagne on deck while the music is blasting and people are dancing around doesn't only happen in the movies. Book this gorgeous 2014 Lagoon 52 and make some of those film fantasies come true. Sail the Adriatic Sea in ultimate style with your closest mates. 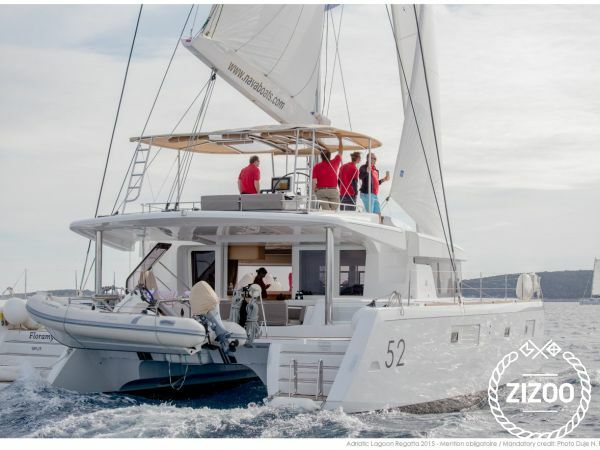 This catamaran features 5 cabins that sleep 10 comfortably, an elegantly designed salon and living area, and a fully functional kitchen. With air conditioning, a CD/MP3 player, a DVD player and a TV, you won't miss any of the comforts of home. Conquer the waves and sail out to some of the most spectacular locations on the Croatian coast. For those who want to experience a celebrity holiday, head on over to the island of Hvar that has hosted guests like Prince Harry and Beyonce as well as countless other A-listers. Who knows, you might get lucky and bump into them. So what are you waiting for, contact the charter crew and book this awesome boat today. We felt like celebs onboard the Lagoon 52. So much space and great service from Marco and Ivona! Will be back next year for sure. Toller Urlaub an Bord dank erstklassigem Service!